Nitrogen surplus from agriculture has a clear effect on the nitrogen status of the groundwater, according to 70 years of Danish measurement data. A 70 years time-series of monitoring data relays a clear message: When farmers apply more nitrogen to their fields than their crops can absorb, the amount of nitrogen in the groundwater increases. When less nitrogen leaches from the soil, due to either improved management or reduced nitrogen application, the amount found in the groundwater decreases. These are the findings of five dNmark-alliance researchers from Aarhus University and the Geological Survey of Denmark and Greenland (GEUS) based on 70 years' worth of data from Danish agriculture and Danish groundwater monitoring. The findings are described in a recent article in Scientific Reports, a journal from the publisher of Nature. It is unique that such results have been demonstrated on such a long-term time scale. The team of scientists from the Geological Survey of Denmark and Greenland, GEUS, and the Department of Agroecology and the Department of Environmental Science at Aarhus University also found that socio-economic development stimulates adoption of measures to protect the environment and that economic growth can curb environmental degradation. - In fact, we can see from the data that it is possible to have economic growth without negative impact on the environment, says one of the authors of the article Professor Tommy Dalgaard from the Department of Agroecology. Many management measures are available to reduce the impact of nitrogen from agriculture on the aquatic environment. These measures rely on four basic principles: right time, right source, right timing and right placement. In addition, the use of nitrogen footprints can encourage consumers to practice nitrogen-sustainable behaviour, such as minimising food waste, eating less meat, and recycling. The tools are in place - so how have they worked out in the real world? The researchers used isotope-based measurements in Danish groundwater from a period of more than 70 years (1940-2014) to analyse the nitrogen sustainability of intensive agricultural nitrogen management in relation to groundwater protection and economic growth. This type of analysis has previously been applied to other environmental quality indicators but is the first time that it has been applied to interpretation of long-term groundwater nitrate measurements. The effect of nitrogen regulation and agricultural nitrogen losses on groundwater quality were evaluated by analysing long-term time-series of nitrogen surpluses from Danish agriculture and nitrate measurements in oxic groundwater at individual monitoring points. The term oxic means that oxygen is present, which is often the case in the upper groundwater containing geologic layers. The researchers focused on oxic groundwater due to the stability of nitrate in the presence of oxygen. They also measured the age of the groundwater at the monitoring points. This allowed the researchers to relate the concentrations of nitrate to the time of recharge instead of the time of sampling, which in turn enabled the team to compare nitrate in the groundwater with the nitrogen surplus from agriculture. In most of the locations there were significant downward trends showing that nitrogen regulation had made a significant difference at these locations. However, there were also locations with no significant changes or even upward trends. - This indicates that a further targeting of current nitrogen management and regulation is needed to reduce the nitrate concentrations in a clear downward direction at these locations to comply with current Danish standards, says Tommy Dalgaard. In Denmark, nitrogen surplus is calculated on an annual basis as the difference between agricultural nitrogen inputs and outputs on a national level. The nitrogen surplus is the amount of nitrogen that is not used and is thus at a risk of being lost to the environment. There is a clear correlation between the annual development in nitrogen surplus and the national concentration of nitrate in oxic groundwater. In the years 1946 to the mid-1980s nitrogen surplus increased continually. Increasing environmental awareness and national environmental plans have since then curbed this trend - while economic growth continues. Like the nitrogen surplus, the nitrate concentrations in oxic groundwater reached its peak around the turning point in the 1980s. The analysis shows that almost 30 years of nitrogen regulation in Danish agriculture have resulted in a clear reduction of nitrate concentration in oxic groundwater. This trend has mainly been driven by societal demands for groundwater and surface water protection. The agricultural sector has been able to adjust to societal demands and innovate agricultural production methods. 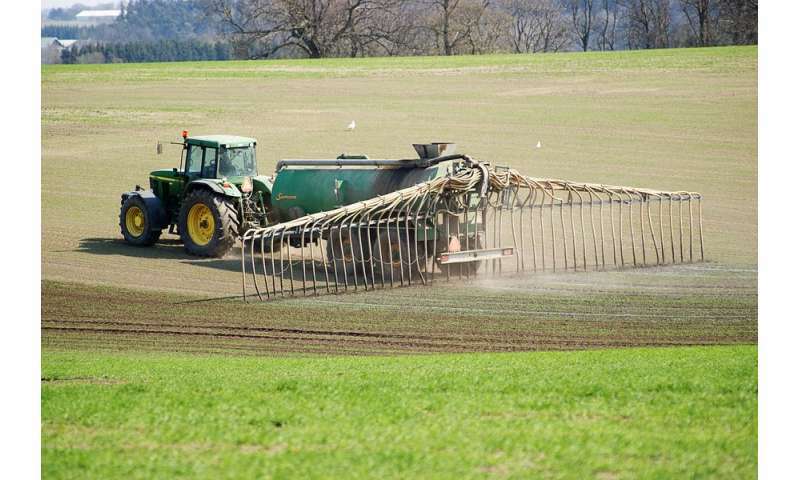 However, the evidence also suggests that a relaxation of agricultural nitrogen applications, and thereby the nitrogen surplus, would result in an increase in nitrate concentrations in oxic groundwater. - Our study highlights the importance of a consistent national groundwater monitoring programme and the need for development of future effective nitrogen mitigation measures in intensive agriculture worldwide in order to protect groundwater resources, says Tommy Dalgaard. Read the article "Groundwater nitrate response to sustainable nitrogen management" in Scientific Reports.